Both are, obviously, insanely evil. They care nothing for the death of innocent bystanders and they both have impressive armories of weapons. I would probably give the edge in planning to the Joker, but the Green Goblin seems deadlier in direct combat. On the other hand, The Joker's usually able to hold his own against arguably the world's greatest fighter, Batman, so you can't count him out. Ultimately, I'd probably go with the Joker, since he's taken down his universe's greatest two heroes in Batman and Superman, while the Green Goblin usually only has to deal with Spider-Man. No slight to our webbed friend, of course, but he's not at a Kryptonian power level. This is actually a tough choice. These are two of my favorite villains. With the Goblin, you can’t discount the man beneath the mask, Norman Osborn. He wound up running the show in the MU, created and lead his own counterfeit Avengers, controlled and manipulated the incarnation of the Angel of Death (The Sentry), and destroyed Asgard. No slouch this one. When you figure this into the equation, you wind up with two of the most dangerous and prolific villains of either universe. Both are maniacs who take the long term view of their schemes. Neither have an issue with killing or using terror as a weapon. Both are known for tormenting their foes before striking what they believe will be the fatal blow. From this angle, I’ve almost got to call this one a draw. The Joker will win because, you know, Batman. I concur with Mr.MikeK… Osborn can outwit the Marvel Universe. Mano-a-mano, The Joker’s psychotic genius frenzy and Batman-survival-factor may just give him an edge over the Green Goblin. No amount of rationalizing will prevent Mr. J from walking away with this one by a margin of 50 bazillion to 1. It would be a cool fight to see. But I think that Joker would take the win in this one. My reasoning is, the Goblin vs. Spider-Man – the Joker vs. Batman, that’s all that needs to be said. 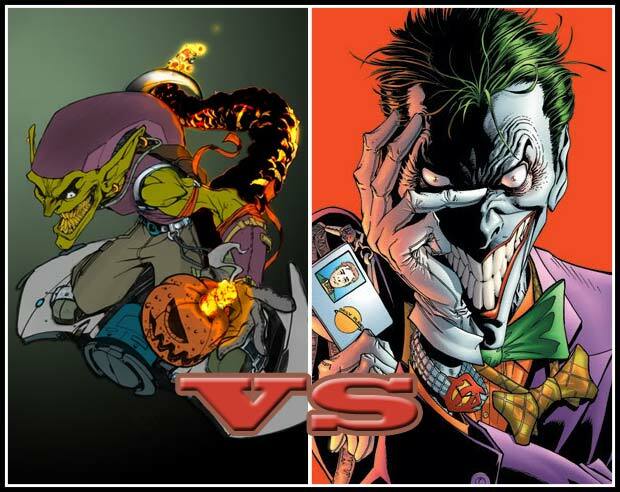 Now on the other hand if you the Green Joker( Goblin Joker mix) vs. the Batspider (Batman Spider-Man mix) then that would be the fight of all fights. It would take at least 12 issues or would have to be a graphic novel because one issue would not do a fight like that justice. This would an awesome battle of Maniac’s and murderer’s.. I would just a crossover with these two in it. But there is one thing in Old Greenie’s favor and thats his own personal power level. his super strong and agile like his hated webslinging enemy his tech can rival that of Tony Stark and then to top it all off he is as resiliant and tough as Captain America and Insane as the Joker.. I adore the Clown Prince of Crime but I’m gonna say Osborn would win the fight…Just. But you gotta believe whatever city they fought in would be a smoking ruin full of the dead by the end of it. I’m tempted to vote for the Goblin, just because I know he’s going to lose. I love both of them, but Joker has the edge. Joker is pretty much the measuring stick for all other villians. Green Goblin vs Batman. Batman would blatantly win. Joker vs Spiderman. Joker wins. Joker vs Batman. Well, batman wins, but there is still a fighting chance for Joker. Joker will always get my vote. With the vote at 76 to 20 in favor of the Joker, should I even vote? I decided to view this from the perspective of the good guys. If I were a superhero, which of these two would I more afraid of / least willing to face on my own? The answer is, hands down, the Joker. The Green Goblin may have superior weapons compared to Joker’s acid-flower and sometimes handgun, but he’s a much more conventional threat. You know what to expect when you go up against the Goblin. With any other villain you can always assume there’s certain things they won’t do. But with the Joker, all bets are off. You know all those things that normally a villain would have to be crazy to try? Well, with the Joker those are not only viable options but realistic or even probable options. I’d be thinking that’s often the Joker’s modus operandi. Yeah, I’m going to have to go Joker here too. Norman Osborn’s accomplishments in villainy are impressive. But when the Joker’s on the top of his game, he can both simultaneously make me laugh and scare the crap out of me. I agree with the others. I more prefer the marvel universe, but for me the Green Goblin (in hungary we call Zöld Manó) is a little bit overwrought. Yeap Osborn have a great stuff and equipment but the sickness to always to kill Spiderman and the bridge fetisim is a little bit to many for me. I think Joker is more psychopatic and insane, and he have a nice and beautifuk henchman whose is one of my favourite villain. And we know it the two is more than one. I Hail for Joker and Harley. Doornik1142: You know what to expect when you go up against the Goblin. While I agree thatJoker wins, let’s not forget that Norman chucked Gwen off a bridge. While it might not be to the level of Joker’s plans for mass murder, you have to admit Spidey probably didn’t see that one coming. Joker is WAY cooler. plus, he fights the cooler hero: BATMAN! Dan: While I agree that Joker wins, let’s not forget that Norman chucked Gwen off a bridge. While it might not be to the level of Joker’s plans for mass murder, you have to admit Spidey probably didn’t see that one coming. Something else to consider, especially in regards to their levels of insanity. The Joker tends to become more dangerously psychotic in his crazier moments. By contrast, Osborn has shown he’s usually more of a threat when he’s lucid, and (at least from what I’ve seen recently) will actually shut down from the real world if he’s off his meds and starting to hallucinate. The Joker because he is able to twist his opponents’ strengths both physically and mentality. He doesn’t have hyperkinesis. Rather, an uncanny ability to calculate odds and reflexes that might as well bend the laws of physics. No doubt the two would study each other exhaustively. I can see Green Goblin throwing a pumpkin bomb exactly where Joker wants it to land. Then later in the fight, the Clown Prince of Crime goads the GG into a fatal nosedive right into the rubble. Sorry, everyone, but the answer is neither wins, no draw. GG blows up 89 bldgs as he tries to get the 3 purple & green sedans flanked by Red Triangle Clown Cars zipping this way and that. Every wrecked and burning car simultaneously starts TALKING through a buried transmitter (or recorder?) in J’s voice, using DIFFERENT WORDS, saying that GG missed [you idiot] are the voices in our heads distracting you, etc. Then GG is so maddened he actually smashes several cars before landing and using an EMP. Fourth, he sneaks up on the living voice and finds a PARROT. GG dies of stroke. J was in 89th bldg. Gotta go with the Joker. Osborn seems more about power for power’s sake, he’s willing to commit any crime if it’ll get him some power. But the Crown Prince of Crime doesn’t seem to care for power, he’d just as soon trade in any power he gained just for the chance to kill just one person. Aside from the usual fanboy nonsense, Gobbie wins this with ease. Vastly superior technology, strong enough to literally rip Joker limb from limb if it comes to close quarters, and a mind to match Joker’s own. J-man gets impaled on the Goblin Glider before he can start to laugh. I think this is the hardest vs. I have ever seen. I usually give the upper hand to marvel, but with this one I think combat wise they are even, but I think Osborn’s problem is that his rage will be his undoing. See even though The Joker is a homicidal lunatic. he not driven by rage, or hate. He kills because it gives him some kind of sick and twisted joy. The other thing The Joker has is the fact he is rthe master of monipulatoin. He finds the one weakness you have in your personality and expliots it till you are driven mad with it. He is like the Charles Manson type. Look at how he turned Harly Quinn from his therapist to his lover/ co-conspiritor. He will be able to drive Osborn so crazy Osborn will make a mistake and the fight will be over. Dan: While I agree thatJoker wins, let’s not forget that Norman chucked Gwen off a bridge. While it might not be to the level of Joker’s plans for mass murder, you have to admit Spidey probably didn’t see that one coming. I think it’s pretty fair to expect a psychotic murderer to commit, y’know, murder. Joker of course, madness is in his blood. If the question was “Who’s crazier?” or “Who’s got a bigger fanbase?” or even “Who would you, personally, rather read about?” the answer would be Joker (though I actually have found I don’t enjoy the Joker in the comics as much as the Joker in the animated series; comics Joker just isn’t all that funny). But it’s who wins in a fight, and the Joker is flat-out outclassed in this one. They’re probably about equally matched on skill, but the Goblin is much stronger, and has better mobility and tech. Don’t get me wrong, I think The Joker is the waaaaaay cooler vilain (though I would dispute the Batman is better then Spiderman comment,but that is a subject for another debate), however, realistically I think I have to go with Green Goblin winning. To be fair it is “who wins in a fight” not “who is the cooler more popular villain” so ya, I say Goblin wins with his, you know, ACTUAL POWERS AND SUPER TECHNOLOGY. Also, The Joker is at a huge disadvantage when fighting villains as opposed to heroes. Batman has beaten The Joker so many times now, but he will never kill him so Joker always comes back to cause more destruction, The Goblin on the other hand, he would just kill the guy. I’m going to go with the fact that Goblin was guided by vengeance, Where Joker just likes to see it all burn. Norman Osborne has at least his son to care about where Joker would bump Harley Quin off if it gave him an advantage. Its something to consider. Tough call, but I lean towards The Joker. The Goblin’s weaponry and tactics are fairly well established. You never know what to expect with The Joker. Joker: some toys & tricks? I voted Green Goblin. To me, the basic idea of GG is simple: what if Lex Luthor were the Joker’s secret identity? The Joker on his own is pretty formidable, but imagine what he’d be like with all of Luthor’s resources. That’s what GG is. So, to me, he has the edge.